Jeffery was named as a beneficiary in his father's will made in Ash-next-SandwichG on 27 June 1639.7 He was left one shilling while his siblings were left substantial amounts. It may have been the case that Jeffery had already been provided for by his father. However, had this been the case, it would have been expected that this would have been referred to in the will, and the leaving of a token amount would not have been necessary. The more likely conclusion is that this derisory bequest was a calculated insult. Jeffery was named as a beneficiary in his brother Robert's will made in Herne, KentG, on 14 November 1658.8 He was left a sum of £1. Robert also left a sum of £3 to his nephew John, with the instruction that the amount was "to be paid by my brother Jeffery Sackett which he owes me." Upon marriage to his second wife, Elizabeth Haite, in 1669, Jeffery's household was also enlarged by the arrival of Elizabeth's young sons, Richard and William. Elizabeth's late husband, Simon Haite, a farmer, had left her well provided for, but financial arrangements between her and Jeffery, in particular over the costs of the maintenance of her sons, were to prove a long-running sore, blighting the marriage and resulting in a protracted and acrimonious legal case in the Court of Chancery.10 The verdict in the case is not known, but the witness statements in Sackett v. Haite reveal much detail of domestic disharmony. The initial action was taken by Jeffery in May 1677 when he sued his stepson William Haite for the costs of his maintenance. The other stepson Richard Haite had died by then. Jeffery claimed that his stepsons' father, Simon Haite, had left them a substantial inheritance and that, under the terms of a settlement at the time of Jeffery and Elizabeth's marriage in 1669, Jeffery was entitled to payment to cover the costs of the boys' maintenance and schooling. William Haite's formal answers, and those of his uncle and guardian, Robert Seaman, were given in June 1677. They counter-claimed that Jeffery had, on marrying Elizabeth, entered into a commitment to provide for Elizabeth and her sons in the sum of £100 should he predecease her or them. This inheritance was secured on a bond for £300 entered into on the day of his marriage by Jeffery Sackett in favour of Richard Crippen acting on behalf of Elizabeth and her sons. It was acknowledged that Jeffery was entitled to recompense for maintenance out of the profits of the boys' estate but it was claimed that he had been fully paid for the periods during which he had provided for them. 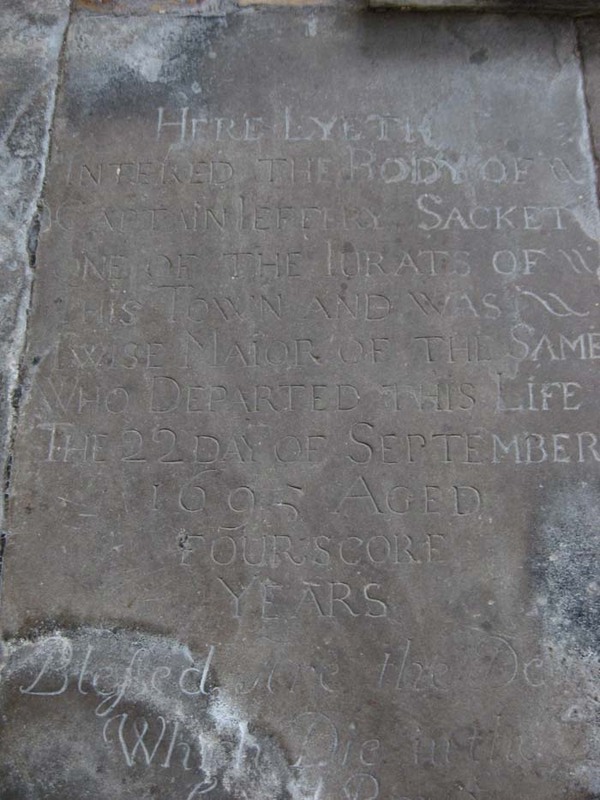 The matter appears to have rested there until 1682 when, about a year after his mother Elizabeth's death, William Haite actioned his stepfather Jeffery Sackett in the Court of King's Bench for alleged debt under the terms of the bond. Jeffery responded by resurrecting the claim for maintenance costs, lodging a complaint in the Chancery Court in November 1682 against his stepson William Haite, William's uncle Robert Seaman, Robert's wife Elizabeth, and other "confederates". The court action dragged on for two years with each side producing a number of witnesses, including two of Jeffery's daughters and his son-in-law Isaac Pierce, a surgeon. The witnesses' depositions give much intimate detail, even including the information that the young William, "by reason he was duringe that time troubled with a flux of urine whereby he did rott and spoile the beddinge and linnen whereon he lay" caused Jeffery to incur a maintainance cost of £14 in the year instead of £12. Jeffery Sackett does not emerge well from the record of the case, with some witnesses testifying to his unkindness and cruelty. No blame appears to have attached to his wife for her decision to leave the matrimonial home. Jeffery, through his achievement in becoming three times the mayor of Sandwich, is seen to have been an ambitious man. He evidently had aspirations to leadership or, at least, to a certain standing in the community. But the damaging revelations in the court case suggest the possibility that Jeffery's father, William, had the measure of his son when, years earlier, he had cut him out of his will. Jeffery's story is a reminder that human nature is not much changed down the centuries! Baptisms Register, St John the Baptist, Thanet, Kent, "30 March 1617 Galfridus Sacket filius Guilialmi Sacket." The origin of the designation "Captain" has not been determined. It would seem unlikely that he was a sea captain. More probably he was a captain of militia. Marriages Register, St Nicholas, Ash-next-Sandwich, Kent, digital image, Findmypast, "2 Apr 1638 Jefferie Sacket & Sarah Swaine." Marriages Register, St Mary Bredin, Canterbury, Kent, "6 September 1669 Jefferie Sacket & Elizabeth Hait." Will of William Saket of Ash, Kent, 27 June 1639, proved in the Canterbury Consistory Court, 31 March 1640 (Kent Archives Office, PRC 31-116-81). Will of Robert Sackett of Herne, Kent, 14 November 1658, proved in the Canterbury Consistory Court, 11 October 1662 (Kent Archives Office, PRC 32-53-196). Email from Sandwich Archivist, Roy Simmons to Chris Sackett, 29 September 2008. Sackett v. Haite (1677–1684), proceedings in the Chancery Court, London (National Archives). Denne & Verrier v. Combes (1680), proceedings in the Chancery Court, London (National Archives). Inventory of the estate of Jeffery Sackett of Sandwich, Kent, taken 5 October 1695 (Kent Archives Office, PRC 11-59-198). Place names are linked to the Place Index, with lists of people having events at each place (down to county level). The superscripted 'G' after place names is a link to the Google Map for that place. Page created by John Cardinal's Second Site v7.03.02.